Home ﹥ FAQs	> FAQ - Camera DCC Filter > ☉ What is the “ Visual Color” photo? ☉ What is the “ Visual Color” photo? ☉ What is the “ Visual Color”? How to shoot the photo with the color well matched to the Visual Color? The “Visual Color” is exactly the colors that our optic nerve observes on the scene. WYSIWYG, What You See Is What You Get! This is the highest state of art of modern photographic technology. Before our two major photographic inventions “Build-in Directivity White Balance Filter” and “External Directivity Color Calibration Filter” were introduced, only the world’s top photographic masters could shoot such a “Visual Color” photo in one shot. By using RAYNAULD™ DCC Filter, everyone can now easily shoot a photo with almost perfect colors anywhere anytime. One can do that by fully extending the black barrel and retrieving the cup filter inside the barrel, then, covering the front lens with the black barrel to conduct the manual white balance action. After that, the filter can be taken off from the lens for shooting. The light shading from the barrel and the solid optical filter cup provides the camera gray color system with the most accurate white balance compensation value. 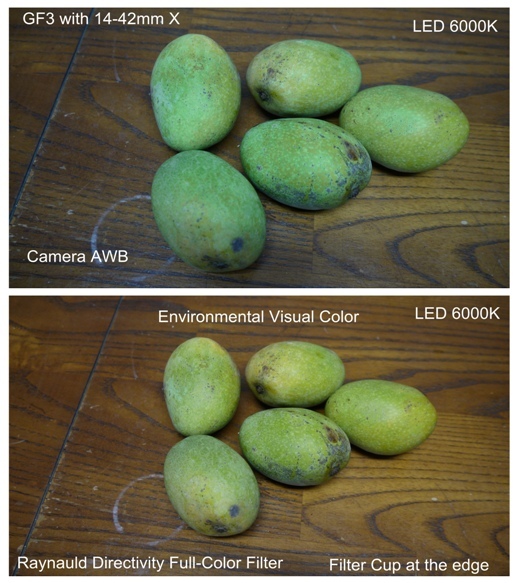 As a result, the camera can be used to take the “Visual Color” photo or video with ease. Of course, different photographic scenes have different light intensities, and if there is a significant change in the scene, it is recommended to use “RAYNAULD™ Directivity Color Calibration Filter” in the new scene to do the camera color calibrating for the best results. A perfect real color photo matching with the environmental vision can keep the momentum touch and casual moments into a color rich and vivid eternal memory. Further more, the camera could be used as a perfect color copy machine to capture the most beautiful and passionate moments of lifetime for future reviews with passion. This is the original inspiration behind the inventive concept of “Raynauld™ Directivity Color Calibration Filter”. For most photography enthusiasts, every shot on the shutter represents their choice of the scene, art’s interpretation and judgments and composition preference of their art creation. The judgments towards the angle of the light and atmosphere of the scene color options are the quintessence of their art creation. With the “Raynauld™ DCC Filter”, they could shoot the mirror image photo in JPG and/or RAW. Thus, they could have a lower baseline standard on colors of photos to work with to smooth their creations.